Cam’s excitement says it all! The defense sacked Cam Newton five times, and Vince Williams came up with a huge play on a pick six to give the Steelers their first lead of the game. The defense gave up just 242 total yards, the lowest output the Panthers have had all season. Defensive line: The defense accomplished its goal of not only pressuring Cam Newton but hitting him at every opportunity. However, they had problems with options runs by Christian McCaffrey, who had 60 yards on nine carries in the first half and finished with 77 yards — the most by an opponent this season. McCaffrey combined for 138 scrimmage yards and three TDs. 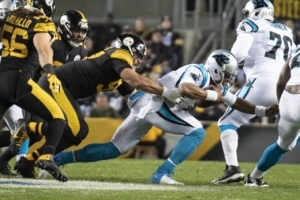 Cam Heyward had two of the five sacks on Newton, who was hit seven times. Have a great weekend! More on the game to come.